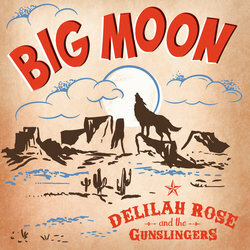 Fronted by Delilah Rose on guitar and vocals, the Gunslingers carry the soul of the Deep South to find a home in tales of our own Wild West. Having grown up in the vast expanse that is the WA wheatbelt, Delilah’s songwriting captures this landscape and brings with it a whole lot of toe-tapping fun. She’s since settled down in the burbs, family in tow, and delights in telling stories to bring a smile to listeners’ lips. Good Grief! is a collection of songs Delilah penned after her dad passed away, exploring love, road-tripping, grief and regret. Keep your ears open for the first single, Big Moon, due out in June with the EP to follow in October, 2018. ‘Big Moon’ is a fun, foot-stomping rockabilly hoedown – an instantly memorable debut single. Distinguished by its earworm vocal hook, Delilah Rose’s signature lyrical wit, and a shuffling, irresistibly danceable groove, it’s a shining first taste of alt-country five-piece Delilah Rose and the Gunslingers’ forthcoming debut EP ‘Good Grief’.